Given the vitality of this linkage, it is regrettable that across wide swaths of the educational scene, the use of argumentation as a gauge of students’ understanding is on the decline. Class sizes are too large for instructors to provide detailed feedback on students’ written arguments, more objective measures of learning, such as multiple-choice tests, are becoming the norm across the curriculum, and distance learning environments are not necessarily conducive to robust argument. Meanwhile, argumentation has become a “hot topic” of Artificial Intelligence research. In the last few years, AI Journal special issues have devoted hundreds of pages to computational models of argument, and new conference series devoted to that topic have arisen and prospered. Argumentation research has implications for the semantic web, multi-agent systems, social networks, decision support in application areas, and educational technology. A growing number of researchers have focused on using computer technology to teach humans argumentation skills, either in general or in application areas. This research has yielded intellectual products such as computational models of argument schema with critical questions geared to specific course content, techniques for integrating argumentation into human computer interfaces via argument diagrams, and tools for engaging students in collaborative argument-making. Or is it? Ironically, in evaluating student learning with argumentation systems, we often face a similar conundrum. Instructors can understand textual arguments, but they do not have time to grade them. Computers work fast but they do not understand textual argumentation. In order objectively to evaluate how well the educational technologies work in teaching argumentation skills, it is tempting to use those same objective measures, for instance, multiple-choice tests, that are supplanting the more subjective, but arguably more probing “measures” based on how well students argue. As work progresses on new educational technologies for teaching argumentation skills, therefore, researchers need to focus on developing new techniques for assessing how well students learn argumentation skills. Fortunately, some are; researchers are inventing ingenious assessment techniques harnessing computer-supported peer review, the “diagnosing” of argument diagrams, and technological ways to enhance the ability of objective tests to probe the depth of students’ understanding. We have come a long way in pedagogy and educational technology to now be positioned to support students in learning argumentation skills with software. Unlike systems that focus on helping students gain well-defined knowledge and problem solving skills, such as intelligent tutoring systems for mathematics, computer support for argumentation, an ill-defined domain, is not a question of evaluating arguments using strict rules and unbending laws and providing definitive feedback on how to construct and improve arguments. It is typically difficult to separate a good argument from a weak one – a single unsubstantiated fact, one that may only be unsubstantiated in a subtle way, in a long line of argumentation may ruin an otherwise sound and well-reasoned argument. Many situations entail strong, and potentially winning, arguments both for and against a position. Furthermore, the “facts” in many argumentation scenarios are not necessarily immutable; they are often interpreted differently in different contexts or by different individuals. In the law, for instance, initial decisions are often overturned in appeals courts, as a new judge interprets a legal argument differently than a prior judge. In short, developing software that can effectively help students learn to discuss and argue in a well-reasoned way, while at the same time inculcating the nuances of argumentation, is truly a daunting task, not the least because argumentation itself is an ill-defined area of reasoning. Nevertheless, the authors of the chapters in this e-Book, as well as a growing number of researchers around the world, are aggressively tackling the task of helping students learn argumentation with computer support. This e-Book is aimed at summarizing their efforts and providing glimpses to the future of the field. But why, one might ask, is argumentation worthy of our attention in education and educational technology? Does it hold the importance of more traditional targets of educational technology, such as mathematics and science? The legal scenario above is a good example of the challenges of learning argumentation, yet how many students aim to become lawyers? The answer to this is that argumentation skills are not specific to professions like the law. In fact, argumentation skills are critical for humans in many aspects of life, both personally and professionally. Some researchers have even characterized argumentation skills as central to thinking itself, supporting people in coming to rational conclusions about issues as varied as gun laws, the responsibilities of countries and individuals in addressing global climate change, and why children in some nations appear to learn more than in other nations. Put simply, argumentation, while very difficult to teach and learn, is clearly an important skill to pass on to the masses in assuring a civilized, well-educated society. Often, human teachers provide instruction on argumentation through face-to-face dialog and direct interaction with students. Sometimes students can even get one-on-one tutoring, an approach that has been shown to be the most effective form of instruction. Yet, while classroom learning and one-on-one tutoring are likely the best ways for students to learn to argue, it is difficult, if not impossible, to “scale up” such approaches, teaching large numbers of students effectively, due to limitations in teacher/tutor time and availability. If educational technology can be brought to bear, then instruction on argumentation, at a large scale, might be realized. 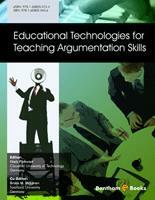 In recent years researchers have investigated the use of educational technologies for teaching argumentation. This volume, which is partially based on a workshop on educational argumentation technologies that was held in conjunction with Computer Supported Collaborative Learning (CSCL) 2009 in Rhodes, Greece, reflects some of this work. The authors of the chapters present a collection of current State-of-the-Art approaches in educational technologies for argumentation, both individual and collaborative use systems. The e-Book begins with chapters that present more conceptual and foundational work, aimed at ultimately providing tools that will help the field of educational technology in evaluating argumentation and argumentation tools. De Ascaniis suggests criteria to design and evaluate argument diagramming tools from the point of view of argumentation theory (chapter 1). Theorists such as Wigmore, Toulmin, Van Eemeren & Grootendorst provide the foundation for De Ascaniis’ criteria, and she focuses on evaluating argument diagramming tools both from the perspective of sound argumentation and how to communicate those arguments in interacting with and influencing people in the real world. Sionti and colleagues pick up on De Ascaniis’ theme of how arguments are communicated by evaluating actual classroom discussions and the patterns that emerge (chapter 2). They use and extend an existing analysis approach that, they hope, will soon be capable of doing automated analysis of such classroom talk. These two foundational chapters are then followed by two State-of-the-Art chapters that provide the reader with information about the state of argument technologies. Dowell provides an overview of collaborative visual argumentation tools, in particular, looking at how such tools have been evaluated for their effects on learning and collaboration (chapter 3). The Dowell chapter picks up on De Ascaniis’ focus on argument diagramming – a technique that is oft used and explored in this area of research – yet more from an analytic viewpoint – how have argument diagramming tools been evaluated until now? – and less from a prescriptive viewpoint, as De Ascaniis does. Dowell raises the significant distinction between evaluating acquisition (i.e., how much knowledge has been gained?) and participation (i.e., how much have the students engaged in productive conversation?). These two strands of analysis have been central to the evaluation of argumentation systems, in general, with different researchers emphasizing one approach or the other. Scheuer and colleagues, on the other hand, provide an overview of argument analysis and intelligent feedback (chapter 4). As opposed to Dowell’s review, which focuses on less interactive systems, Scheuer et al., report on past work that, for instance, attempts to use artificial intelligence techniques, such as machine learning and text mining, to evaluate the content of arguments and to provide some feedback or help to the student. While in-roads have been made in this area of educational technology for argumentation, it is also made clear by Scheuer et al., that there are many challenges ahead, such as the fact that adaptive systems – those that can track and react to the actions of students – are not nearly reliable enough yet to be used in practice. The remainder of the e-Book (chapters 5-10) describes systems that are targeted at different aspects of argumentation, in different domains. Unlike the Dowell and Scheuer et al., chapters, these chapters go deeper into specific work, providing the reader with, effectively, case studies of modern systems for learning argumentation. In chapter 5 De Chiara, Manno, and Scarano present the CoFFEE (Collaborative Face to Face Educational Environment) framework, an open software environment for incorporating a variety of collaborative tools. The contribution of this software is that it provides a flexible infrastructure that allows the integration of different student tools, both argumentation focused and otherwise. The CoFFEE system explicitly acknowledges the real-world constraint that argumentation support systems will not typically be used in isolation – they need to be incorporated in a larger suite of student tools. Next, Loll and colleagues discuss the LASAD (Learning to Argue: Generalized Support Across Domains) technology (chapter 6). Like CoFFEE, the LASAD system is aimed at providing flexibility, but less in the sense of incorporating other tools and more as software that can be used in different argumentation contexts. This is achieved through the provision of different ontologies – representational elements that students can use for arguing – and a variety of ways to configure both the ontologies and the underlying web-based software. LASAD builds on the work discussed earlier by De Ascaniis and Dowell in that the primary mode of support for argumentation is through argument diagramming. In the next chapter (chapter 7), Bouyias and Demetriadis present “iArgue”, an argumentation tool that is capable of presenting and fading collaboration scripts (chapter 7). Scripts are an important structuring concept used by CSCL researchers across a range of collaborative activities and domains (i.e., not just argumentation) that provide guidance to collaborators on explicit steps to take and roles to assume. Bouyias and Demetriadis operationalize the script concept within their software, including the gradual elimination (or fading) of the structure as student collaborators become more competent. In chapter 8, Easterday describes “PolicyWorld”, an intelligent tutor embedded within an educational game for teaching deliberation. PolicyWorld is distinguished in part by the fact that an intelligent tutor, a system that tracks student activity and provides feedback accordingly, is used to guide student learning of argumentation. Chapter 9 (Ravenscroft, McAlister and Sagar) also focuses on the use of (dialogue) games for learning argumentation and presents the InterLoc system, evaluated in a series of case studies. As do other chapters in this volume, Ravenscroft and colleagues focus on the collaboration aspect of argumentation learning. Finally, the last chapter of this volume (de Groot, chapter 10) presents experiences gained from using the Argunaut system, a collaborative tool to help teachers orchestrate classroom argumentation. This system is distinguished by its emphasis on providing feedback to the teacher about student discussion and argumentation. The idea is to keep the teacher in the loop, providing enough information to him or her so that she can, in turn, guide student behavior. We hope that this e-Book will attract readership in the growing scientific communities of (a) educational technology researchers interested in investigating and developing technologies to support the acquisition of argumentation skills and (b) researchers who are interested in pedagogical and technological approaches in ill-defined domains. For these communities, we expect this e-Book will provide a valuable collection of papers that can guide system design.